This is today's view of the Oriental poppy seen in my last post. We're now on day 5 of rainy weather, for which I am truly grateful and appreciative ... it could continue for another five days and I'd still feel that way! There's a lot blooming on my corner of Katy but many of those blooms are indeed bedraggled. What's a gardener to do when the rainy day coincides with Garden Bloggers' Bloom Day (hosted on the 15th of each month by Carol of May Dreams Gardens)? Well, if you're this gardener, you invite your fellow gardeners to commiserate with you on the soggy state of affairs! So I'm starting off by sharing pictures of some of the dampened darlings on my corner of Katy. None is more pitiable than the Spiderwort below. I call this cultivar Zapped, since I dug my original start of the plant from beside Zapp Hall in Warrenton, Texas. The name certainly fits its current condition. The roses are feeling the weight of the rain and holding their heads up is impossible . Doesn't Old Blush look sad? Earl Grey larkspur are a delicate shade of mauve which does not hold up well to repeated dowsings. Lobelia 'Candy Corn', however, is loving the moisture! Bluebonnets and toadflax intermingle happily in the rose bed. Toadflax and verbena are blooming throughout the back garden. The rain hasn't deterred the monarch caterpillars from continuing to munch. I think of Texas Betony (Stachys coccinea) as one of the more xeric plants so I'm pleased to see it continuing to bloom enthusiastically. True confessions time: that is indeed Laura Bush Petunia hiding amongst the orange Betony blooms. Why I planted the Texas Betony there when it's not compatible with the color scheme, I don't remember. I meant to move it but I don't have the heart when it's doing so well. I just have to find the right companion plants to tie the colors together. It could happen! I think next year I'm going to plant bluebonnet seeds all along the side wall of the house in the granite path since they seem to thrive there. The Head Gardener is threatening to try sowing bluebonnet seeds in the St. Augustine grass out front as well, just to see what happens. The Head Gardener does a lot of that kind of thing. Hi, Cindy! Bedraggled by rain? I'll take it rather than bedraggled by drought. Lovely flowers! And a lot going on, that's for sure. Reminds me I need to plant more Texas betony. Think how nice things will look next weekend! You know I just love those Texas Poppies, even sodden ones. 'Zapped' may be zapped, but it's a fantastic color. 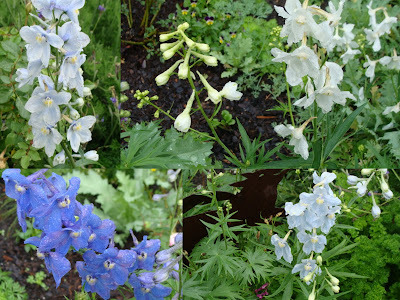 I thought your Delphiniums were the highlight of your garden, until I got to the photo of the Bluebonnets & Toadflax - wow! Your garden is beautiful, even in the rain. Thanks for braving the elements to share it with us! Hi Cindy. Thanks for stopping by my blog. Stop by again to see the progress. Your garden looks great. I enjoyed reading your posts. Much to like here, but I am really interested in the candy corn lobelia. I am assuming it is the annual (for us) lobelia. Anyway, great blooms and congrats on the rain. Ooo, I love the picture with the toadflax and the bluebonnets. We've gotten a lot of rain too. The garden will jump once the sun comes back out. Old Blush won't be hanging her head for long! Your delphiniums and bluebonnets are especially gorgeous. I have red delphiniums here, and purple lupines, but neither of them has bloomed yet. We're loving the rain, aren't we? That Candy Corn lobelia is eye-catching. You have a lot in bloom! Your garden is all the more beautiful bedraggled by rain...because it means there will continue to be a garden! Even in the rain it is easy to see how many lovely blooms you have. What a good idea about putting bluebonnets in the gravel path. I may have to try that since I have gravel here and there. Congrats on your rain. My garden was a bit bedraggled by it as well. But I am still thankful! Linda and Gail and Nancy: we had an extended period of moderate drought here about 7-8 years ago ... I swore then that I would NEVER again complain about getting too much rain. And I haven't! MMD, the delphiniums were purchased in 4 inch pots and I must have held my mouth just right when I planted them! Carol, I'm always happy to brave the elements for Bloom Day! EAL, this is a perennial lobelia. It's a very assertive spreader but not too hard to remove/contain. It does get funky looking in hot weather but responds well to cutting back. I'd be happy to send you some. Mine was a division from a plant a friend bought at the old Heronswood. Sweet Bay, I do plan to plant more toadflax and bluebonnets together next fall. I ordered the linaria seeds late, then kept forgetting to plant them till it was too late! Bluestem, I will definitely check up on your progress. Glad you came by my blogspot! QBC, thanks for stopping by! RED delphiniums? Tell us more! Pam, choosing what to include in Bloom Day photographs is always tough here at Wit's End. Jean, I think sowing bluebonnet seeds in the gravel should yield great results since they seem to like it lean and mean. Hi back at you, Cindy. I like the asclepias...I had seeds and intentions but spent too much time blogging! Wow, your rain must have moved our way. We are currently getting drenched! I'm sure you remember those Hawaiian rains where you get about an inch an hour, and it's so loud you can't hear anything-definite flash flooding possibility! Your garden is beautiful, drenched and all! Glad you all are finally getting the rain you need. Dreamy, the last time I was in Hawaii was March 2006. One of those torrential downpours hit and we had to take shelter on the porch of Kalapawai Market in KailuaTown. Somehow being drenched in Hawaii doesn't seem as burdensome as it would here at home! oh my, I love that candy corn salvia ~ it looks like a penstemon and I added Texas betony to my garden last season. I'm hoping it survived the winter. It's so pretty and the hummingbirds love it so much. I am embarrassed to say I missed the part on Carols Bloom Day post about visiting the gardens before and after ours. and I've been terrible at maintaining my blog in the last week due to some unusually warm weather. Your garden looks really pretty. I wish we could have some of the rain you enjoyed on bloom day. We are very, very dry here. Thanks for visiting me. oops, I meant Candy Corn lobelia, not salvia. My brain must not be awake this morning. Kathleen, I'm so glad you stopped by and I hope to see you again! When the weather's good, my blog definitely gets neglected in favor of the garden!